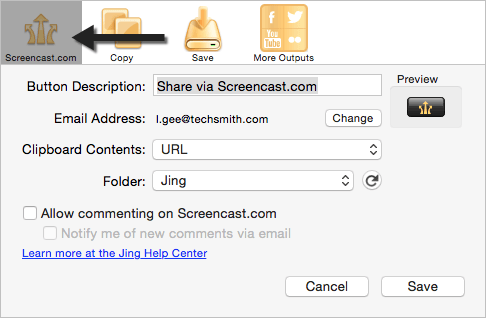 Most of the time when you use Jing to capture an image or video you probably save it or use the Screencast.com button to retrieve a handy link to your content, which you share with others. Jing can also be configured to return HTML embed code so you can insert your image or video directly into a blog, website, wiki and more. "What does embed code do? It sounds complicated." Here's the same image, but this time I pasted the embed code into this web page. As you can see, embed code makes it possible to kind of "copy and paste" an image into a website or other HTML authoring tool similar to how you might paste an image into a document. Embed code allows you to do this with videos, too! First, create a new button. Click More > Preferences > Customize buttons. Enter a logical name in the Button description field. This description appears as the tooltip for your button and will help you tell your Screencast.com buttons apart. A good description might be Screencast.com Embed Code. Choose HTML Embed Code from the Clipboard Contents dropdown menu. Select the folder where your content will be stored. Optional: Allow viewers to comment on your content on the Screencast.com website (not directly on the embedded content). Click Save. The new button appears to the right of your other Jing Output Buttons. You can click and drag it to move it to another place. Close the Custom Jing Buttons dialog box. Now that you have your new Screencast.com button, you are ready to capture images or videos as usual, and click the button you just made to have embed code copied to your clipboard. Paste it as HTML into your blog post, web page, wiki, or other HTML authoring tool. Can I change the size of my images? Yes. In the embed code there are height and width tags. Remember if you change height by, say 25%, you should change the width 25% or else the image will appear distorted. If a user clicks the image they will be linked to the original size image on Screencast.com. Can I make it so users can't click on my embedded image and link to the original content on Screencast.com? Yes. Delete these two highlighted parts as shown in this example. Can I change the size of my embedded videos? Yes, the embed code returned by Screencast.com can be manually altered for SWF videos. You must change the height and width in four places each, shown highlighted in this example. Remember if you change height by, say 25%, you should change the width 25% or else the image will appear distorted. Why won't my video embed code work on my blog/wiki/etc? Video embed code in particular might not work with every HTML authoring tool. For example, some wikis (or their administrators) might not allow it. Check with your service provider or admin if this happens to you. Can I retrieve my own custom embed code from Screencast.com? At this time, there is no way to customize your embed code. You must manually change the code once you paste it into your HTML authoring tool.